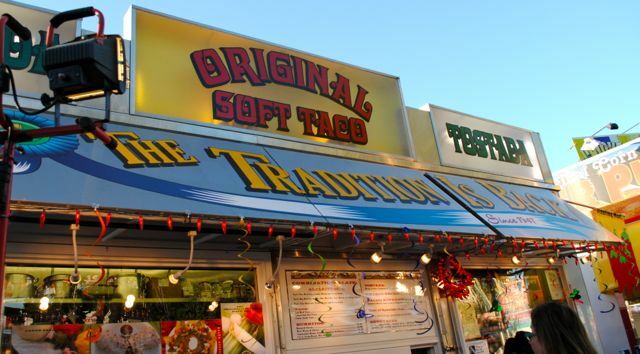 UPDATE: When the fair opens today, many fans will be heading straight to the Original Soft Tacos booth for their annual fix. I’ll see you there soon. When I heard, yesterday morning, that the Sonoma County Fair’s soft tacos had returned after an absence of three or four years, I could barely concentrate on the day’s work. Finally, at about 7:15 p.m., on a picnic bench across from the booth, I tucked into a solid half-dozen of the yummy little things as I watched fan after fan savor theirs. I’m actually a bit late to this delicious party. The ‘Original Soft Taco” truck–really, it’s more of a trailer–returned three or four years ago, but I had failed to find them in their new space and eventually gave up looking. I even gave up going to the fair, as these tacos were my favorite part. Ahh, all those tacos I could have eaten! Darn. If you are not familiar with these tacos, let me describe them. They are quite simple. A corn tortilla–a special one, not like those you can buy in almost any market–is wrapped around a mixture of ground beef (sort of; it seems more like minced but I don’t think it is), subtle seasonings and shredded Iceberg lettuce, which goes limp from the heat of the meat. Without the hot sauce that sits on a nearby condiment table, they are a tad bland but really good. Slip the tip of the nozzle of the hot sauce bottle into the taco and squeeze, so that a trail slips all the way down, and the flavors soar, magically. There is some kind of special alchemy going on here. The taco is juicy, drippy and messy to eat. And it is glorious. I tasted my first of these soft tacos sometime in the early 1980s. Always wary of fair food, I ordered just one and I stood nearby to eat it. I was dazzled and immediately went back for another and then another and in those few minutes it became a beloved tradition. I ate them every year and a few times I ponied up the price of admission, ate my fill–I think I topped out at nine–and left, not the booth but the fair. I was devastated when they did not reappear after the remodeling of the Mexican Village. I was not the only one. There was a deluge of phone calls to fair management, who in turn called the proprietors of the booth, many many times. And so they returned, though it is not quite that simple. There’s an interesting story to these tacos and to their disappearance and reappearance. The company that makes them is Nigretti Enterprises and it is a family venture. 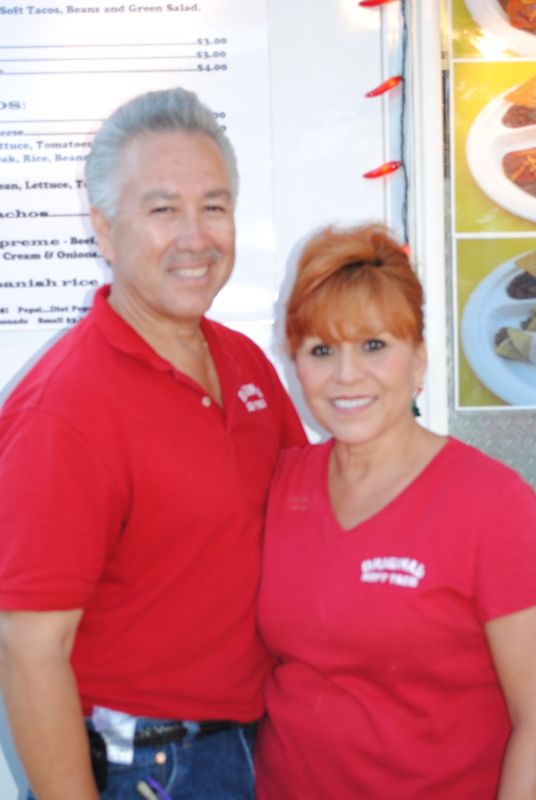 Nina and Benny Martinez stand in front of their menu. Yes, there are other things besides tacos, including burritos, tostadas and more. 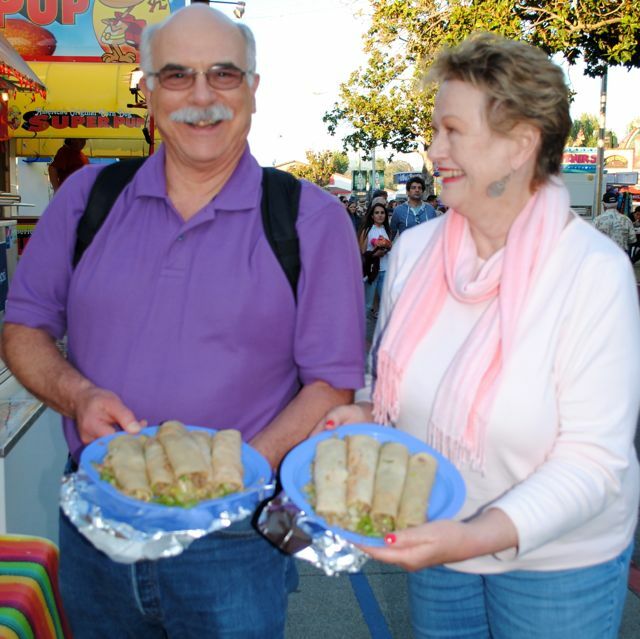 In 1947, Oscar Chapa launched “Soft Tacos From the State Fair.” His three sisters developed the recipe for the tacos. Sometime in the early 1970s–I think I understood this correctly–Paz and Josie Nigretti moved from Boise, Idaho, to take jobs with Mr. Chapa. After working for him for five years, they bought the business. 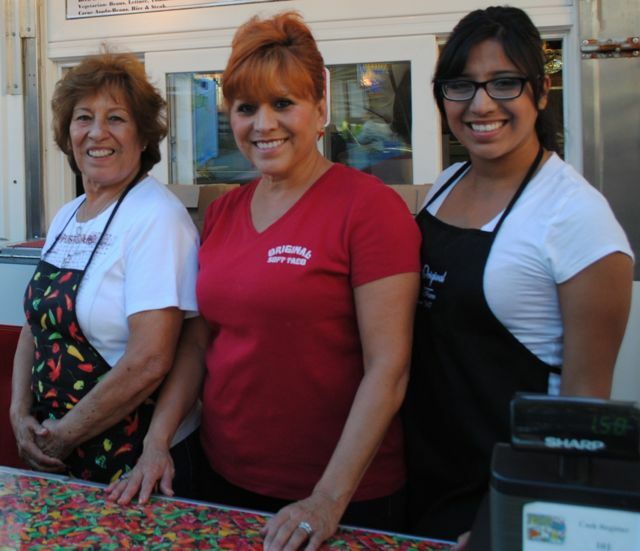 Every year, they made the rounds of several California fairs, Sacramento, Sonoma County, Madera, Lodi and Fresno. Eventually, their daughter Nina joined the family team and soon her husband Benny Martinez was part of the crew. When Benny and Nina’s daughter Alexis was old enough, she, too, became part of the staff. Today, three generations of the Negretti family run the operation. Josie Nigretti with her daughter Nina and granddaughter Alexis: Three generations, working together. Right about the time the Mexican Village at the Sonoma County Fairgrounds was remodeled, the Negrettis moved on to another endeavor, a restaurant in downtown Stockton. They also did a lot of catering. So long, soft tacos, unless you lived nearby. 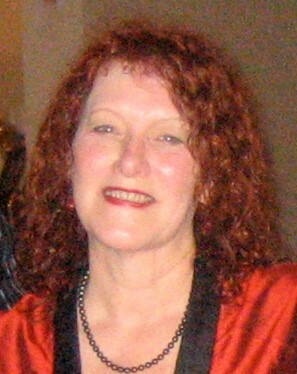 A few years into the restaurant operation, Paz had a health crisis. At the same time, they were getting pleading phone calls from fair managers, who were trying to lure them back, if only to quiet the roaring demands of fairgoers. They got the portable kitchen up and running. Paz returned to good health..
All was right with the world, as you can see today by the steady stream of customers, big smiles on their faces. On Thursday evening, Peg and Mike Ferrel of Santa Rosa were on their third visit this year. They come for the tacos, bringing their own plates and forks so that they needn’t use any disposable materials. Mike’s plate was piled with five rolled tacos, served “naked,” i.e., without their paper wrapping. 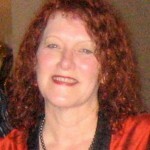 Peg had four. As we chatted, we discovered our paths had crossed before, specifically at a dinner at Worth Our Weight, where I was cooking and they were guests. Peg, who has been eating these tacos since 1972, and Mike are not fast-food junkies. They know deliciousness, even when it’s to be found at a booth nestled between giant pretzels, deep-fried pickles and foot-long corn dogs. “We’re coming back again next Thursday,” they said, inspiring me to consider doing the same, if I can wait that long. The Ferrels’ preference for “naked” tacos helped launch a new trend. 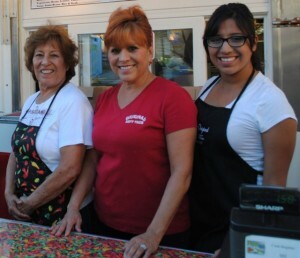 On a typical fair day in Santa Rosa, the Nigrettis sell nearly 3,000 tacos and likely more on busy weekends. They sell even more at the fair in Fresno, although it is not particularly large. But they set up four locations at that fair and go through thirty-five cases of lettuce each day. That’s a lot of tacos. You’ll find Original Soft Tacos on Linwood Ave., a bit west of the entrance to the Mexican Village. To find them on Facebook, enter “The Original Soft Taco” in the search bar.